These are themes we’ve explored plenty of times on this blog so won’t rehash here. But there were a couple of other interesting points to come out of ECB President Mario Draghi’s press conference though. 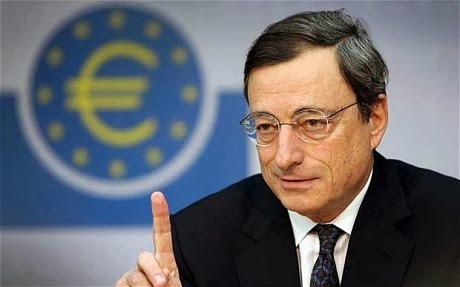 The first being his mention of a new dataset which the ECB is looking at, specifically the “the high degree of unutilised capacity” in the eurozone economy. This refers to the ‘output gap’, i.e. the amount by which GDP in the eurozone has fallen below potential GDP. As you might imagine, estimating such a gap is fraught with difficulty and estimates are notoriously revised retrospectively (for example before the crisis few economies were seen performing above potential despite huge financial, real estate and debt bubbles). Why is this important? Well, it could be the first step towards a more firm GDP target on the part of the ECB. Admittedly, it’s a small step and a full GDP target is unlikely but it could be an interesting shift for the ECB which has traditionally focused more on inflation, money market and private sector survey data (such as the PMIs). As Draghi himself said, it also shows that monetary policy will stay looser for longer, even if the data improves, due to the large gap between actual and potential GDP. It will be interesting to watch how this one develops over the next few meetings and whether the ECB decides to put any more emphasis on this measure.